Steve and I left St. Barth May 8 to attend several family graduations; I have made two trips back to paradise in between. I was going to write a blog about the family milestones but I figured that was way off-topic and I didn’t want to bore you. I just got back from vacationing in France where I took most of the family to celebrate. 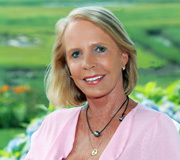 Today’s blog is a Guest Blog written by our St. Barth Specialist, Kathy Schlitzer. Enjoy! 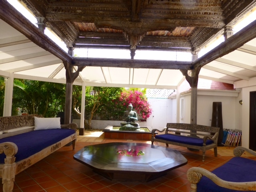 I often ask clients what it is that brings them back to St Barth year after year. Certainly they travel to other parts of the world as well, but they say their annual time in St Barth is sacred. They tell me it’s the only place they can truly relax in their hectic world. They love their daily routine that may include picking up fresh croissants and a baguette at the local bakery, reading and napping around the pool or on a favorite beach, a long lunch (preferably with feet in the sand) and no one hovering with the check, and dinner in or out, usually decided at the last minute. Actually they say most everything is decided at the last minute! No plans, no rush, no stress. Having just returned from my semi-annual working trip I didn’t exactly have that experience but I’ve been to St Barth on vacation in the past and can corroborate. It’s best to go to St Barth often and without a list of things to do, if you’re coming to relax just chill and let it happen. I stayed at two amazing villas this time. My colleague, our US concierge Julia Hurd, was with me all 8 nights, and the St Barth Properties President, Peg Walsh, for the first 4 nights. 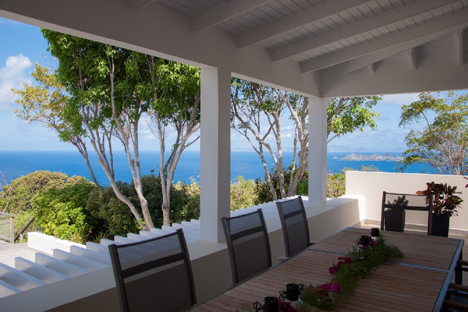 First stop – Villa Valentina, located on the windward side of Pointe Milou you can always count on a really nice breeze. We left the sliders open when we were there, three of us sitting around on our computers – if you have to work the breeze is very welcome. 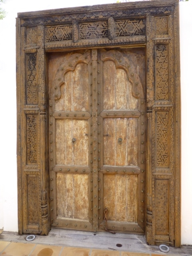 Valentina has the most interesting entrance, an amazing Balinese wooden door opens into a lobby with an ornate antique ceiling and both door and ceiling were shipped from Bali when the villa was built – the sound of a fountain and a Buddha complete the feeling of serenity! Very unique – very cool. The house was comfortable and the view is amazing. After 4 nights at Valentina we were reluctant to leave but off we went to Villa Belle Bague in Colombier. Belle Bague is also a 4 bedroom villa with an amazing view and comfortable indoor and outdoor space. It too has a consistent breeze and Julia and I spent all our down time on the comfy couches on the deck. After touring the villa with the manager, both of us commented on the outstanding amenities included in this villa – the kitchen is a chef’s dream, every pot, pan, serving dish, cutlery, stemware, appliance and cooking gadget was there. Clearly the owner spends time at his villa and wants to be comfortable – happily the renters reap the benefits too. I could picture a large dinner party on the deck with candles and stars and the sound of the fountain and soft music in the background. The bedrooms are mostly equal and all have television with cable and Hopper (a DVR for Dish customers), DVD – and WIFI router. WIFI reception was excellent and watching movies on my bedroom television put me to sleep after a long day. There wasn’t a thing we could think of that was missing. Unfortunately the weather turned cloudy so my personal pictures don’t do the villa justice but this is a very special villa. Did I mention the large, heated (in winter) pool with fountain! From personal experience I highly recommend both Villa Valentina and Villa Belle Bague for families or couples. I saw many villas during my stay, too many to mention here, but I visited several that are new to us and notable. Our two new villas on Flamands Beach – Micela and La Sirène are a wonderful option for those looking for beach front villas. Colibris is a new studio villa tucked away in Camaruche and perfect for honeymooners. La Côte Champagne in Petit cul de sac has 4 bedrooms, a huge pool, stunning view and connecting bedrooms. I can see either couples or families with kids enjoying this villa. 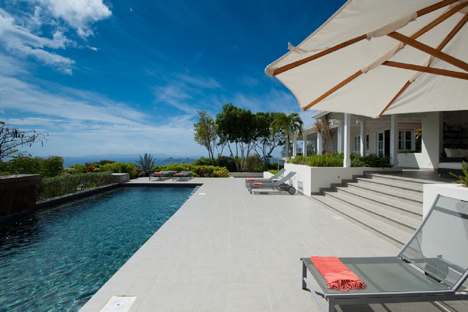 I saw several new luxury villas that were over the top amazing – notably Villa Les Étoiles in Pointe Milou. This villa was designed to capture both sunrise and sunset and the view takes your breath away. When I visit villas I picture the type of client I would recommend for the villa based on layout, location and amenities, for Les Étoiles I could see couples or family enjoying this villa for many reasons. 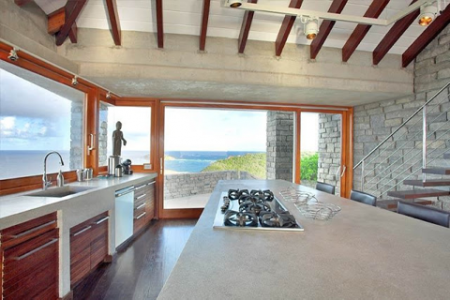 For instance when I entered the chef’s kitchen with the large island I could picture an evening with a chef, a cooking class while sipping a good wine, dining al fresco under the stars. That is St Barth! I could go on and on about the villas I saw, the meals I enjoyed, and the people I met but I’d better get back to work. Au revoir St Barth, à la prochaine fois.